If you need to regularly upload and download files from a server then Cyberduck is an excellent free FTP client with a simple GUI that makes it very easy to perform all manner of FTP tasks. 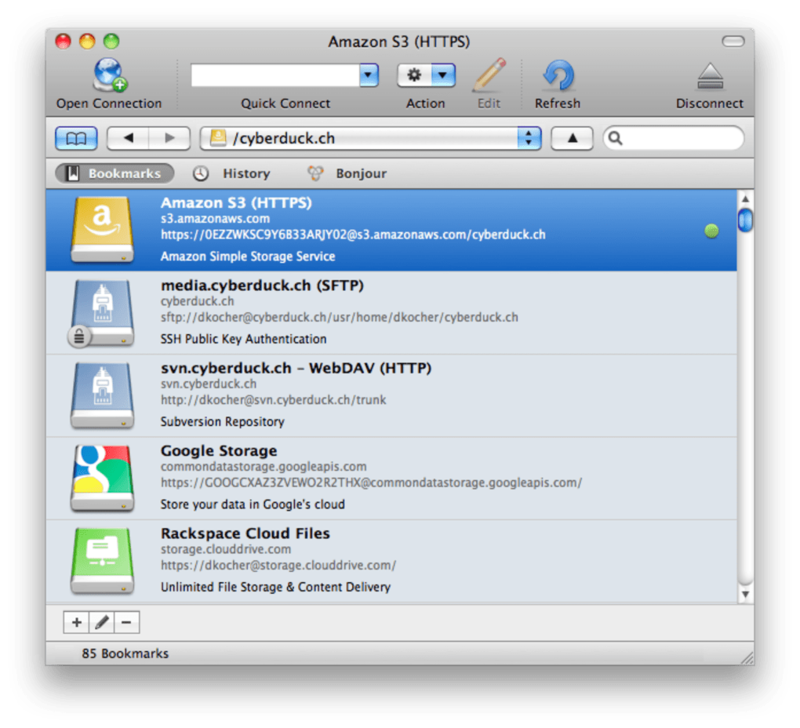 Cyberduck is suitable for almost all FTP transfers including FTP, SFP, Webdav and Amazon S3 transfers. For those looking for a reliable and free FTP client, Cyberduck ticks all the right boxes. You'll also find that Cyberduck is compatible with most external editors such as BBEdit, TextWrangler or TextMate. Cyberduck is also integrated with Dropbox for exchanging files. Some users have found that Cyberduck can sometimes be unreliable when transferring files. Depending on the reliability of the server you are using, you may find that connections time-out half way through, particularly when using SSL connections. Adding a new connection in Cyberduck is very simple and only takes a couple of seconds with helpful tutorials for first time users. For convenience, you can even drag and drop bookmarks to and from Finder. The Cyberduck interface is clearly laid out, easy to use and with an extensive Help guide and Cheat Sheets making it a good starting point for those new to FTP. 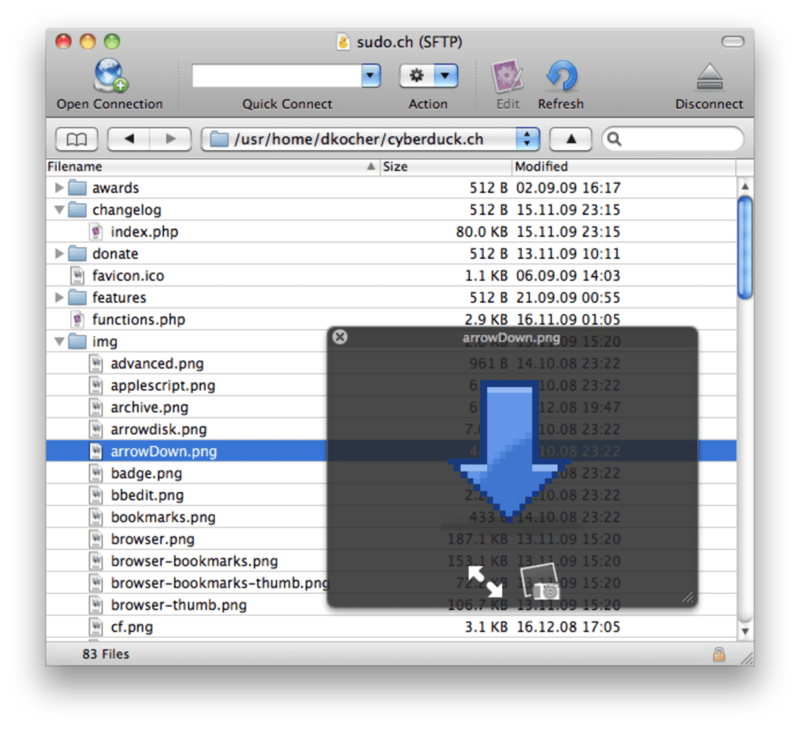 Overall, Cyberduck is an excellent, generally efficient and elegant open source FTP client for Mac. Libre FTP, SFTP, WebDAV, S3, Azure & OpenStack Swift browser for Mac. Cyberduck is an FTP, SFTP, WebDAV, S3 & OpenStack Swift browser to transfer files to your web hosting service provider and connecting to cloud storage accounts from Rackspace Cloud Files, Google Storage and Amazon S3 with the same easy to use interface with quickly accessible bookmarks. The browser allows to download, upload and move or copy files using drag and drop with an hierarchical view to browse large folder structures efficiently. Transfers are handled with ease including synchronization of local with remote directories. To edit files, a seamless integration with any external editor application makes it easy to change content quickly. Both Amazon CloudFront and Akamai content delivery networks (CDN) can be easily configured to distribute your files worldwide from edge locations. It was so good once. Loved it till the Yosemite update. Then, instead of connecting to FTP it started to run into random connecting loops and errors. FTP is not a toy to test its stability with buggy soft. Free, stable, easy to use. Stable but old design. I prefer trying something newer.... Similar functionality to YummyFTP and ViperFTP but it's free. Viper Lite is also free but more functional and better desing. If it could managed many accounts (Lite can only one) would be the winner.